The week before last I traveled to Dar es Salaam, Tanzania to provide mapping and spatial analysis support to agricultural researchers at a Research Methods workshop organized by the McKnight Foundation Collaborative Crop Research Project (this is the same project that sent me to Ouagadougou last year). I collaborated with researchers from Tanzania, Malawi, and Mozambique, and was part of a team of support staff from the UK, Germany and Tanzania that included statisticians, plant breeders, and entomologists. The week was intense but highly productive, and I will continue working with these researchers and their projects over the next year as they strive to increase crop yields and improve soil health. Plus the workshop was held at a beach resort which was very conducive to brainstorming sessions! The participants were organized into three groups, based upon their projects' interests: breeding, soil fertility management, and pests/disease. The groups were led by Eva Weltzien, Ric Coe, and Tim Chancellor, respectively. The groups met in the morning, and the afternoons were reserved for one-on-one half-hour consultations with the resource people (including me). I spent my mornings working on requests from the previous afternoons' consultations, a system which I think worked pretty well. 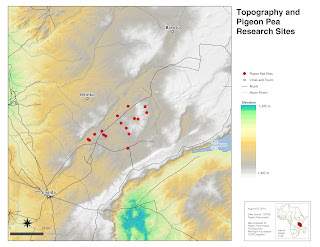 Once again we used open source software, primarily QGIS for GIS, R for statistics, and ODK for mobile data collection. Group shot on the last day. I was originally standing in the back next to Ric and Sam but the group said I was too short so they insisted I move to the front! Some of the support staff I worked with during the week, from L-R: Tim Chancellor, an entomologist/plant pathologist from University of Greenwich; Sam Dumble, a statistician from University of Reading, Eva Weltzien, a plant breeder from the International Crop Research Institute, and Prudence Kaijage, the man who organized the whole workshop and ran all the logistics. 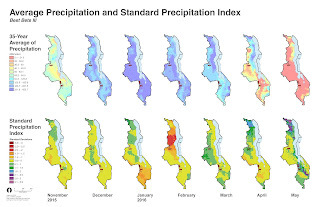 A new piece of data and analysis we were able to offer to participants at this Workshop is Standard Precipitation Index data which we derived from CHIRPS data, produced by the Climate Hazards Group at UCSB. 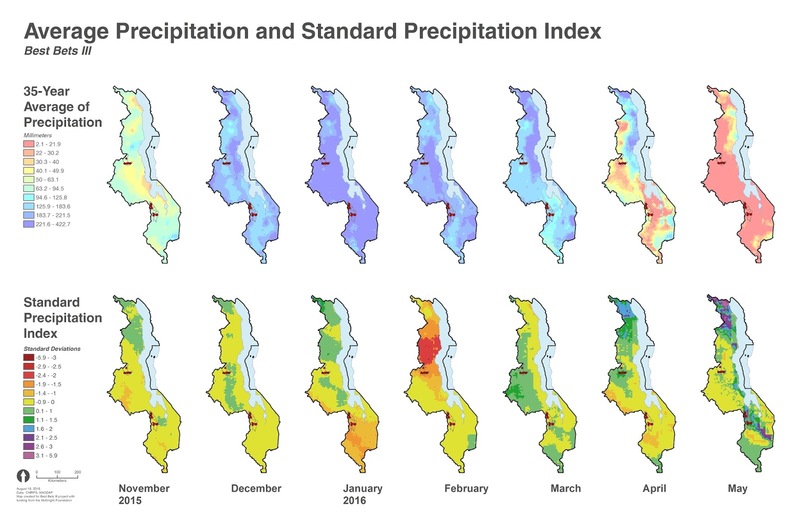 The CHIRPS dataset is quite remarkable, and although it is not perfect, is extremely useful to the researchers because of its utility in both interpreting their research results and understanding long term trends in precipitation. 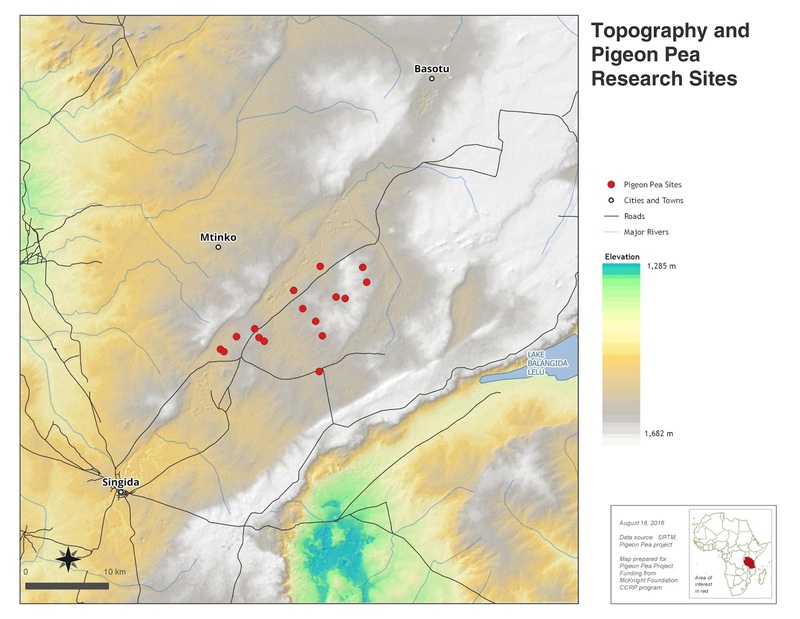 CHIRPS is a 30+ year quasi-global rainfall dataset that blends data from ground-based observation stations and satellite data. 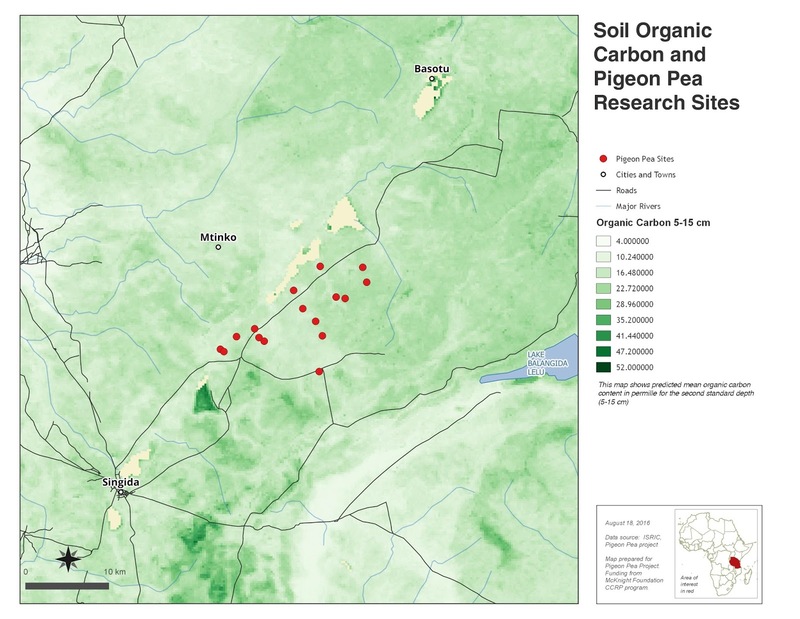 The data has a global spatial resolution of 0.05 x 0.05, and daily data are available for Africa at a resolution of 0.25 x 0.25 degrees. Data can be downloaded in daily, pentad, dekad, monthly, 2-monthly, 3-monthly, and annual time steps. I used it both for the Cowpea Systems project in Mozambique and for the Best Bets project in Malawi. 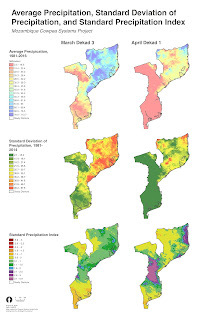 The Cowpea Systems researchers wanted to see patterns of precipitation relative to their study areas for the two dekads that bracket the end of March/beginning of April. The SPI clearly shows the very dry conditions in the southern part of the country, where many farms failed. The Best Bets project requested both monthly average precipitation and monthly SPI for all months in last year's growing season. In both cases, the SPI maps express precipitation over a given period in terms of standard deviations from the 35 year average for the same time period. My dance card filled up quickly! I walked for about an hour every morning at sunrise. This is a Dhow, a traditional lateen-rigged sailing vessel.